Born on November 6, 1883 in Providence, Rhode Island. Graduated from Annapolis in 1905 and commissioned in 1907. M.A. from Columbia University in 1914. Assistant Chief, then Chief of the Bureau of Engineers 1931-1939. Rear Admiral in June 1938. Director of the Naval Research Laboratory 1939-1942. Special Assistant to the Under Secretary, then Secretary of the Navy 1942-1947. Vice Admiral in July 1946. Retired in June 1947. Decorations included the Distinguished Service Medal. Died on August 1, 1965. 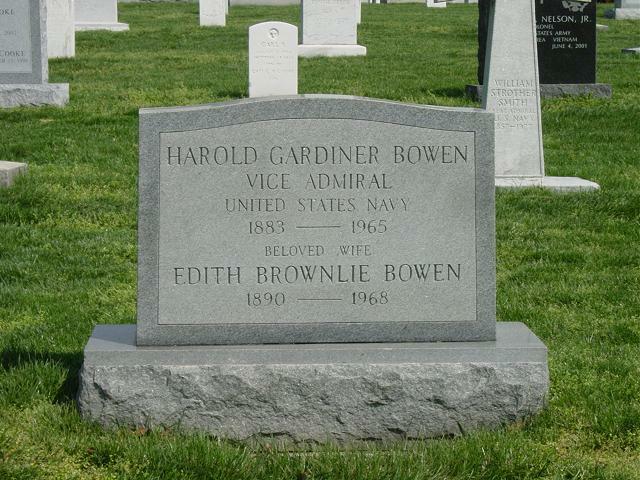 NOTE: His son, Harold Gardiner Bowen, Jr., Vice Admiral, United States Navy, is also buried in Arlington National Cemetery. Posted: 17 July 2007 .